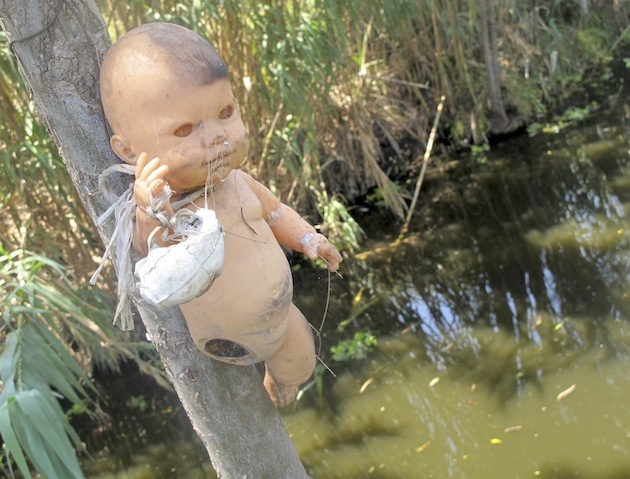 Would you visit the haunted Island of the Dolls? Can you hear the whispers on the island of the dolls..? The island in the middle of the lake had been there for over a thousand years. 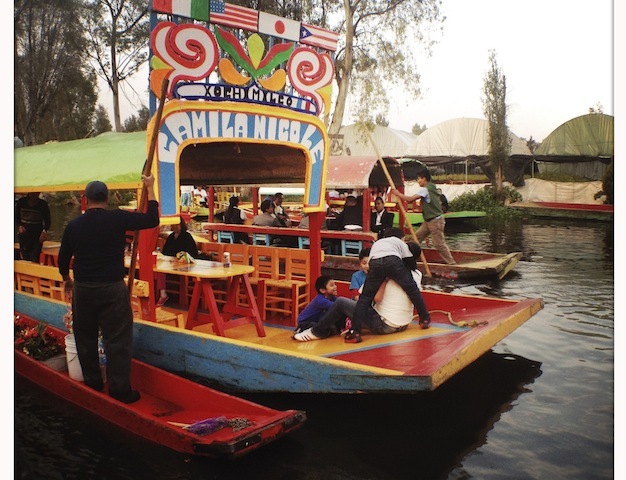 It had started out as a raft floating on the shallow water, made by the ancient Aztecs as a floating garden. Over the years, mud and soil had been piled on the raft and an island had formed. In the fertile, watery soil, crops were planted and thrived. There are islands like just like it in lakes all over that part of Mexico. All used to grow fruit, vegetables, brightly-coloured flowers. All floating silently on the still, fresh waters. 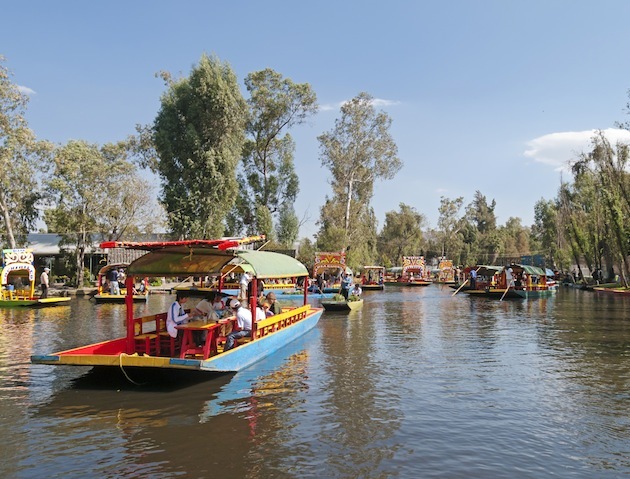 But this particular island, in Lake Xochimilco, south of Mexico City, doesn’t always float silently. For people say you can hear the sound of whispering – quiet, like the rustle of grass in the breeze. And it would seem to come from the thousands of dolls that have called the island home since the early 1950s. Each of the dolls hangs on the island’s trees and bushes. And each has been placed there by one man, Don Julián Santana Barrera. Julián was working as caretaker of the island in the 50s when he came across a little girl in the water. Somehow, she’d found her way from the shore onto the island. But she’d fallen into the water. The young Julián did all he could to save the drowning child. But she’d slipped from his grasp, her lifeless body sinking deeper into the silent water. Julián was distraught. He couldn’t manage to save her and the poor girl had drowned. Soon afterwards he saw a doll in the water. The girl’s toy. Carefully, he fished it out and, as a mark of respect, he hung it from a nearby tree. 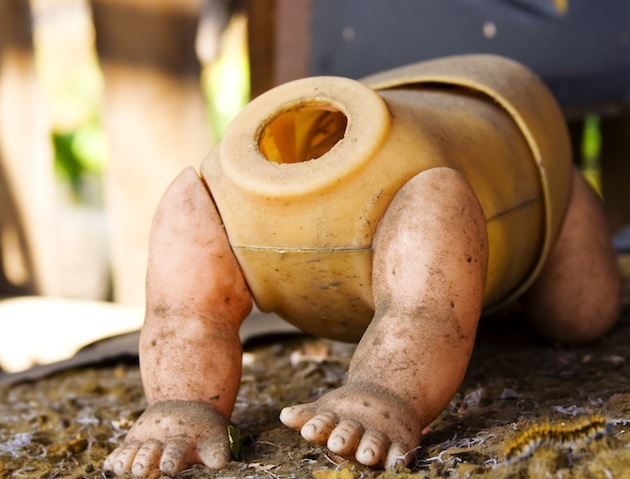 As the years passed, Julián would scavenge the banks of the lake and rubbish dumps looking for abandoned dolls.  Whenever he found one, he’d hang it somewhere on the island. And over time, Julián came to believe the dolls had begun whispering to each other. He believed they urged him to collect more and more dolls, to hang them on every tree of the island, every bush. Soon, Julián himself made his home on the tiny island. He built a hut, eked out his existence, cut off from the world with no electricity and no services. It wasn’t long before the dolls covered the entire island. In time, their pink, plastic skin faded in the bright, Mexican sun. The rain lashed their hair into matted knots and the wind blew out their eyes. But, still, Julián heard their whispers, urging him to collect more. He told the rare visitors he had to the island that the dolls walked around the island at night, even that they killed animals. Then, in early 2001, Julián’s nephew visited him on the island. Julián told him that voices were calling him from the lake where that little girl had drowned 50 years before. ‘Ignore them,’ Julián’s nephew told him. But it seems Julián couldn’t ignore the voices from the shallow waters. On 21 April that year, Julián was found dead, face down in those shallow waters where he’d seen the girl drowned. 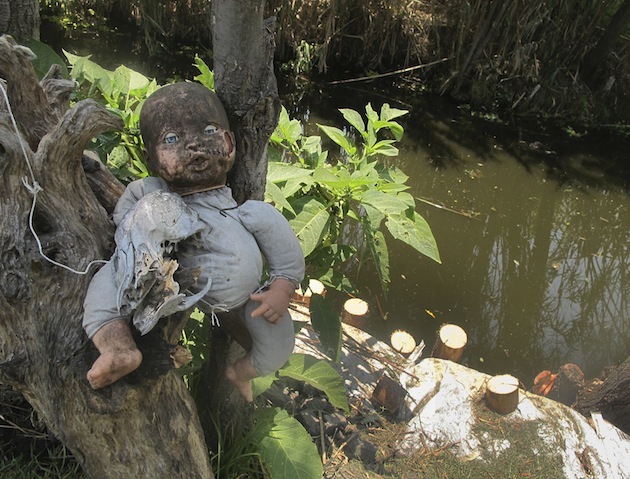 In the years since then, the Island of the Dolls has become something of a tourist attraction. People flock there to take photos of the dolls hanging in the foliage. Except sometimes, tourists claim to have heard the dolls and to have seen them turn their heads or move limbs. 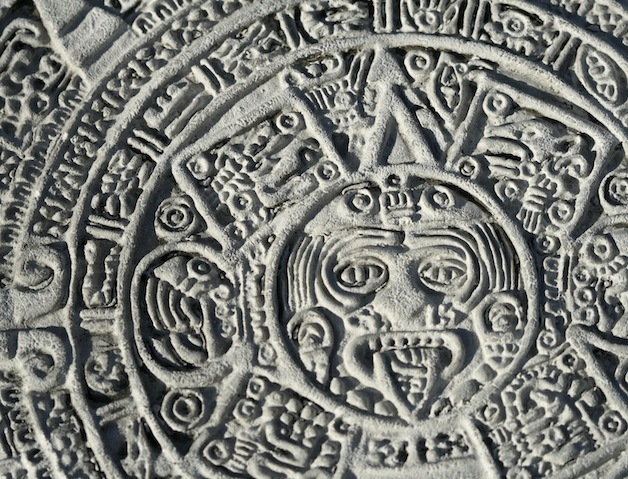 The island has become famous throughout Mexico and local historians have been keen to investigate its history. Still, try as they might, no record can be found of that little girl, or of her tragic death over half a century ago. No-one knows who she was, where she came from, what she was doing on the island. Some have suggested the girl never really existed. They say Julián moved to the island because he’d fallen into alcoholism. Some believe he’d been shunned and the island seemed to him like a place of refuge. He’d lived there in solitude, totally isolated from the world and from other people. So had he simply imagined the little girl falling into the water and drowning? Could she have been a trick of the mind, created by his own loneliness? Yet other people suggest there might be a supernatural explanation. The man-made island has been there for over a 1,000 years, and they suggest that perhaps the girl drowned in its waters, maybe hundreds of years ago, before people recorded such things. The death Julián witnessed could have happened generations ago, but was being played out and repeated by spirits. Chances are, we’ll never know.